It’s hard not to argue that for one hot minute last winter, HTC’s Butterfly — known as the Droid DNA in the US — eclipsed the One X/X+ as the company’s flagship. The combination of a brilliant 5-inch Full HD display and zippy quad-core S4 Pro chip set a new benchmark for all superphones. HTC’s follow-up — the One — hit the tech world like a ton of bricks. It raised the bar even further thanks to its superb design, Snapdragon 600 processor, UltraPixel camera and BoomSound speakers. Which brings me to the Butterfly S, an updated Butterfly that incorporates many of the One’s features and packs a massive 3200mAh battery without being supersized like the One max. It isn’t coming to the US this time around, but I got a review unit anyway. So, how does the Butterfly S differ from its predecessor? 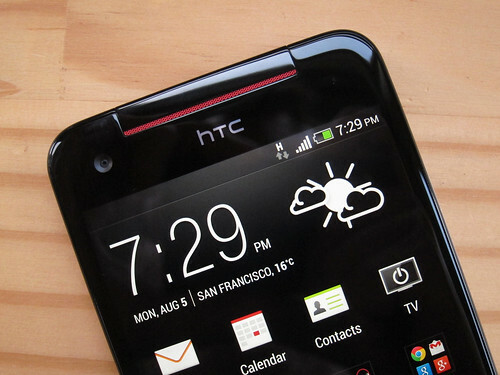 Is it a better phone than the HTC One? Hit the break to find out. Like some Butterfly versions, the Butterfly S features a flap on the right side of the top edge concealing the micro-SIM and microSD card slots. Speaking of flaps, the micro-USB power and data connector is no longer covered by one — it’s also been moved to the left of the bottom edge. While the volume rocker, standard 3.5mm headphone jack and power button remain in the same location, the latter’s lost its metal finish to accommodate an IR blaster. Sound familiar? In front, the red earpiece grille and black plastic trim-piece from the DNA carry over but are now duplicated below the three red capacitive buttons — yes, the Butterfly S rocks the same BoomSound stereo speakers found on the One. The front-facing camera and notification light are unchanged, but the screen’s been upgraded to Gorilla Glass 3. Despite keeping a similar shooter, flash and HTC logo arrangement in back, the phone lacks the handy secondary notification light I enjoyed on the Butterfly. Under the hood, the Butterfly S benefits from an updated SoC. The 1.5GHz quad-core S4 Pro used on the original gives way to Qualcomm’s Snapdragon 600 (APQ8064AB) clocked at 1.9GHz (vs. 1.7 GHz on the One) — this also means the handset gains WiFi ac. Most of the other specs carry over, with 2GB RAM, Bluetooth 4.0+LE with aptX, GPS / aGPS / Glonass and NFC. The display uses the same gorgeous 5-inch 1920×1080 Super LCD 3 IPS panel I loved on the DNA, now clad with Gorilla Glass 3 for extra protection. In terms of radios, my review unit (HTC 901e) lacks LTE but includes quadband GSM / GPRS / EDGE and quadband UMTS / HSPA+ (850, 900, 1900 and 2100MHz) up to 42Mbps. While the 2MP wide-angle front-facing camera is identical to the Butterfly’s, the eight megapixel main shooter gives way to an UltraPixels sensor (4MP) without the One’s signature OIS lens (more on this later). As for audio, the Butterfly S sticks with the company high-quality 2.55V headphone amp and gains BoomSound stereo speakers with Beats. I already mentioned the upgraded 3200mAh embedded Li-polymer cell — it provides a significant improvement in battery life over the outgoing 2020mAh pack. While the Butterfly was no slouch in term of performance, HTC cranked things up a notch with the Butterfly S by replacing the quad-core S4 Pro with a Snapdragon 600. It’s basically the same SoC that’s fitted inside the One, but bumped from 1.7 to 1.9GHz. Subjectively, the updated phone feels just as fluid and responsive as its sibling flagship. The higher clock speed only really comes into play when running benchmarks and yields slightly better results across the board. Compared to the original, the new handset is measurably faster. Despite increasing thickness and weight, the larger 3200mAh battery (vs. 2020mAh) also brings a welcome boost in stamina. Where the DNA often struggles to last an entire busy day, the Butterfly S easily soldiers on late into the night. At one point, I even managed to coax over 48 hours of light use from the device. This was reflected in my battery rundown test — looping a 1080p video from a full charge at half brightness and volume with WiFi turned on but not connected and Bluetooth disabled — which came in at eight hours and ten minutes (vs. six hours and 38 minutes for the DNA). Calls sounded loud and clear in my tests, and I recorded data speeds of about 7.5Mbps down and 1.5Mbps up on AT&T HSPA+ network in San Francisco. Audio quality shines over headphones, but the BoomSound speakers, while decent, lack the detail and punch I enjoyed on the One. While the Butterfly featured the same impressive eight megapixel camera as the One X/X+, the Bufferfly S inherits the One’s 4MP Ultrapixels sensor, f/2.0 autofocus lens and single LED flash, but not the flagship’s optical image stabilization. This, of course, is a major let-down since OIS is what makes the One’s shooter truly shine. Sure, larger 2µm pixels gather more light, but fewer pixels also mean less detail. With the One, I accepted the compromise HTC made of lowering resolution for the sake of improving low-light performance, but the lack of OIS on the Butterfly S (and the One mini, and the One max) negates the Ultrapixels advantage. That being said, the Butterfly S still takes lovely pictures in most conditions. Color balance is pretty accurate and exposure is usually fine, but just like with the One, the sensor can be overwhelmed in bright scenes. Low-light performance is excellent as long as the handset is kept steady. Video is captured in HD at 1080p and 30fps with a bitrate of 21Mbps and stereo audio. The results (video above) are decent but here again, the lack of OIS makes a noticeable difference. As for the camera interface, the Butterfly S echoes the One with the same strength and weaknesses. This means the Butterfly S includes HTC’s wonderful Zoe and Video Highlights functionality, but still lacks the ability to lock focus and exposure by pressing and holding the on-screen shutter button. In terms of software, the Butterfly S runs Sense 5 on top of Android 4.3, just like the One, One mini and One max. While it’s not as pleasant as using a Google Play edition or Nexus device, it’s a simple, fast and intuitive enough experience, and certainly better than other skins (Samsung’s TouchWiz comes to mind). Since my review unit is factory unlocked, there’s no carrier contamination to deal with, just HTC’s usual suite of pre-installed apps, which includes Car, Flashlight, Kid Mode, Notes, Scribble, Tasks, TV and Watch. BlinkFeed’s present as well, and is still as polarizing as ever. Some folks find it annoying, others like it — I’ve just learned to live with it. With a larger 1080p screen (5 vs. 4.7 inches), faster processor (1.9 vs. 1.7GHz), better battery life and a microSD card slot, the Butterfly S could almost replace the One as HTC’s flagship — just like the Butterfly (and DNA) dethroned the One X/X+ last winter. Beyond the plastic build, which falls short of the One’s machined aluminum construction, the Butterfly S lacks two critical features: OIS and a north-American variant with LTE. It’s almost as if HTC deliberately crippled the Butterfly S to keep it in the shadow of the One. Still, if you want an HTC phone with solid battery life, microSD storage and you can live without OIS, the Butterfly S could be a contender in some markets. There’s also the One max, but while it boasts similar specs, it comes in a significantly less manageable package. At $600 unsubsidized, the Butterfly S isn’t cheap – I’d be more inclined to spend that kind of money on the One and enjoy the benefits of OIS, not to mention that phenomenal Google Play edition.